The Italian-born Elsa Schiaparelli (1890-1973) was in many ways an outsider, yet one who successfully made her way to the heart of French haute couture in the interwar years, operating her business between 1927 and 1954. Born in Rome in 1890, the daughter of an orientalist scholar, she first left Italy in 1913. She traveled via Paris to London, where she married a theosophist named Wilhelm Went de Kerlor in 1914. During World War I, she and her husband moved in artistic and cosmopolitan circles between Europe and the United States. 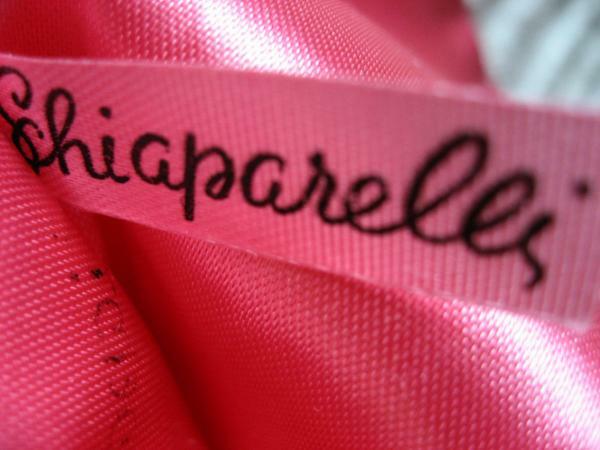 When Schiaparelli separated from her husband in the early 1920s, she returned to Paris with her young daughter. There she came to know Paul Poiret, who often loaned the impoverished young woman dresses to wear. With Poiret's encouragement, Schiaparelli began to design clothes and sell her designs on a freelance basis to small fashion houses. She briefly became the designer of a small house, Maison Lambal, in 1925 before setting up an atelier in her own name in 1927. Schiaparelli's first collection featured hand-knitted trompe l'oeil sweaters, including an extremely successful black-and-white "bow-knot" sweater that was illustrated in Vogue and immediately sold in the United States. Her subsequent collections extended beyond sweaters to include dresses and suits, swimsuits and beach pyjamas, ski costumes and sports jackets. In the early 1930s her "Mad Cap," a simple knitted hat with distinctive pointed ends that could be pulled into any shape, was a runaway success in the United States, where, like the "bow-know" sweater, it was widely copied by mass-market manufacturers. In 1928 she launched her first perfume, S.
In the late 1920s and early 1930s Schiaparelli was primarily a designer of sportswear whose geometric patterns and sleek lines were in keeping with the mood of the moment. Yet these early collections contained many hallmarks of her styles of the later 1930s: the innovative use of fabrics, often synthetic; striking color contrasts; such unusual fastenings as zippers; and such eccentric or amusing costume jewelry as a white porcelain "Aspirin" necklace designed by the writer Elsa Triolet. Schiaparelli's designs proved popular with Parisians and New Yorkers alike. Despite the 1929 economic crash, which significantly depleted the fortunes of French haute couture, Schiaparelli was still able to work successfully with American manufacturers in the early 1930s, and to sell her models to exclusive importers like William H. Davidow and such stores as Saks Fifth Avenue in New York. Later she was to remark that the more outrageous her designs became, the better they sold to a conservative clientele. Despite Schiaparelli's reputation as an artistic designer, she was always commercially successful. Throughout the 1930s the fashionable silhouette changed; from the early 1930s Schiaparelli developed the boxy padded shoulders that were to characterize her mature style. Notable designs from 1934 included a "tree-bark" dress-actually crinkled rayon-and a "glass" evening cape made from a new synthetic material called Rhodophane. Schiaparelli benefited from significant developments in textiles in the 1930s, but she was never purely technologically driven. Rather, her work was galvanized by the themes of masquerade, artifice, and play- themes that related closely to the changing status of women in the interwar years, as well as to the avant-garde discourse of the surrealist artists and their circles, some of whom she worked with in the 1930s. Schiaparelli moved her boutique to the Place Vendôme in 1935, commissioning Jean-Michel Franck to decorate her new premises. Their ever-changing décor incorporated, at various times, a stuffed bear that the artist Salvador Dalí had dyed shocking pink and fitted with drawers in its stomach, a life-size dummy of Mae West, and a gilded bamboo birdcage for the perfume boutique. In 1935 Schiaparelli inaugurated themed collections, starting with Stop, Look and Listen for summer 1935. "Schiaparelli collection enough to cause crisis in vocabulary," read a contemporary review of Stop, Look and Listen (Schiaparelli, p. 87). Following the Music Collection of 1937, Schiaparelli surpassed herself in 1938 and showed four collections in a single year: the Circus Collection for summer 1938, the Pagan Collection for autumn 1938, the Zodiac or Lucky Stars Collection for winter 1938-1939, and the Commedia dell'Arte Collection or A Modern Comedy for spring 1939. Her presentations were more like shows or plays than the conventional mannequin parade. Incorporating stunts, tricks, jokes, music, and light effects, they were dramatic and lively, and entry to them was as much sought after as tickets to a new play. In 1937 Schiaparelli launched the color of vivid pink that she named "shocking," alongside her perfume Shocking!, packaged in a bottle designed by the artist Leonor Fini and based on the shape of Mae West's torso. The same year saw the designer's Shoe Hat ensemble, a black suit with pockets embroidered with lips and an inverted high-heeled shoe for a hat. The hat came in two versions, one that was all black, and the other, black with a shocking pink heel. The 1938 Circus collection featured a black evening dress with a padded skeleton stitched on it, boleros heavily embroidered with circus themes, and an inkwell-shaped hat whose feather resembled a quill pen. The 1938 Zodiac collection featured more highly encrusted embroidery such as the mirror suit, in which inverted baroque mirrors were embroidered on the front panels of the jacket and incorporated pieces of real mirrored glass. Schiaparelli encouraged the embroidery firm Maison Lesage to revive techniques from both medieval ecclesiastical vestments and eighteenth-century military uniforms. 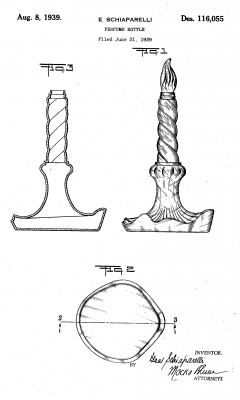 The result was a series of highly wrought evening jackets and accessories in which the decoration of the garment became a carapace or form of female armor. While Schiaparelli was clearly established commercially as a fashion designer, she also retained many links, both personal and professional, with surrealist artists. In New York during World War I she knew Francis Picabia and his then wife Gabrielle, who introduced her to the artistic photographer Man Ray and the painter/sculptor Marcel Duchamp. Schiaparelli was photographed by Man Ray in the early 1920s and then again in 1930. Man Ray regularly took photographs for fashion magazines, including Vogue and Harper's Bazaar; some of these photographs also appeared in the surrealist magazine Minotaure, which was published between 1933 and 1939. An essay of 1933 by the surrealist writer Tristan Tzara was illustrated by Man Ray's photographs of Schiaparelli's hats. She in turn employed many surrealist artists to design accessories for her. The writer Elsa Triolet made jewelry for Schiapiarelli and other couturiers, with her husband Louis Aragon acting as the salesman. Alberto Giacometti made brooches for Schiaparelli, while Meret Oppenheim produced furlined metal bracelets. Christian Bérard illustrated Schiaparelli's designs and many of the program covers for her openings or fashion shows. In 1937 the designer used drawings done for her by the artist Jean Cocteau as trompe l'oeil embroidery on two evening garments, a blue silk coat and a grey linen jacket. Schiaparelli's collaboration with Salvador Dalí, however, which began in 1936, produced a series of the most striking designs: chest of drawer suits (with horizontal pockets that looked like drawers and buttons that resembled drawer handles) from 1936, an evening dress with lobster print and a shoe hat and suit from 1937, and an evening dress with a tear design from 1938. Apart from these accredited collaborations Schiaparelli produced many surrealist designs of her own from the start of her career, some clearly in homage to her contemporaries, others apparently her own inspiration: black suede gloves appliquéd with red snakeskin fingernails inspired by Man Ray; a telephone-shaped handbag inspired by Dalí and a brain-shaped hat made of corrugated pink velvet; buttons in the shape of peanuts, padlocks, and paper clips; multicolored wigs coordinated with gowns; and the first fabric designed to mimic newsprint, printed with Schiaparelli's own reviews in several languages. Meanwhile, Schiaparelli maintained her contacts with fashion-related industries in both the United States and Britain, collaborating with textile and accessory designers on specific ranges as well as selling model gowns through exclusive importers. She also worked in both theater and the cinema as a costume designer, most notably dressing Mae West for the film Every Day's a Holiday (1937). Throughout the 1930s Schiaparelli continued to travel, many times to the United States, and once in 1935 to a trade fair in the Soviet Union. Although based in Paris, she had opened a branch of her salon in London in 1933. Schiaparelli's international clientele included Lady Mendl, Wallis Simpson, and various titled Englishwomen; she frequently designed costumes for such elaborate costume balls of the decade as the honorable Mrs. Reginald Fellowes's Oriental Ball in 1935 and Lady Mendl's Circus Ball of 1938. The chic and distinctive Daisy Fellowes was Schiaparelli's unofficial mannequin; the designer dressed her for free and she in turn attracted international publicity in newspapers and magazines as one of the few women who wore Schiaparelli's more outré designs. If Daisy Fellowes personified the Schiaparelli look, the American Bettina Bergery, née Jones, personified the designer's spirit. Equally elegant and rakish in her own person, Bergery was the editor of French Vogue between 1935 and 1940 as well as Schiaparelli's assistant, responsible in the late 1930s for the witty and iconoclastic window displays in Schiaparelli's salon on the Place Vendôme. Schiaparelli, who had taken French citizenship in 1931, set out on an American lecture tour after the Germans occupied Paris in 1940. She chose to return to the occupied city in January 1941, but within a short period was forced to leave again for New York, where she spent the remainder of the war. Schiaparelli's Paris house remained open throughout the war and produced collections, although they were not designed by Schiaparelli herself. 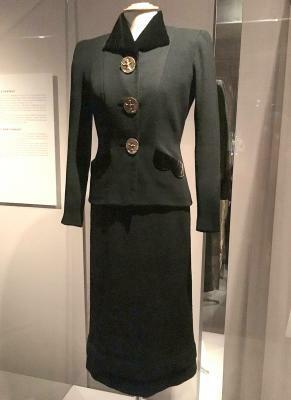 Her early wartime designs, made before she departed for the United States, often used military themes but in a playful way, such as a one-piece "air-raid shelter" trouser suit. She also pioneered many innovative pocket designs in her Cash and Carry collection for spring 1940. She returned to Paris immediately after the end of the occupation in 1945 and resumed designing, picking up where she had left off in 1940, but focusing more on unusual cuttings and draping. Schiaparelli's designs from this period included a hat like a bird's nest with nesting birds; illusion bustle dresses; and inverted necklines that rose to cover the cleavage but dipped to reveal the breasts. Throughout the late 1940s and early 1950s Schiaparelli continued to make merchandising and licensing deals with several American companies, but in terms of innovative design Cristóbal Balenciaga and Christian Dior took the lead in the 1950s. Dior's New Look of 1947 ushered in a new era in fashion. Schiaparelli's fortunes declined gradually after that; in 1954, the same year that Coco Chanel returned to Paris couture, Schiaparelli's Paris salon filed for bankruptcy. Thereafter the designer spent much of her time in Tunisia, where she had bought a house in 1950. Her autobiography, Shocking Life, was published in 1954. Schiaparelli died in Paris in 1973 at the age of 83, survived by her daughter Gogo and her granddaughters, the actresses Marisa Berenson and Berinthia ("Berry") Berenson Perkins. Shiaparelli's fashion legacy was a vast body of endlessly inventive and original designs. She made elaborate visual jokes in garments that layered images deceptively on the body, to explore the themes of illusion, artifice, and masquerade. One of her couture clients, Nadia Georges Port, recalled: "For us 'Schiap' was much more than a natter of mere dresses: through clothes she expressed a defiance of aesthetic conventions in a period when couture was in danger of losing itself in anemic subtitles" (Musée de la mode, p. 125). Less well known, however, is the fact that, despite her apparently avante garde designs, she always maintained successful business relationships with American middle market manufacturers. In this respect she is a paradigm of the modern designer, marrying a fertile imagination and dramatic showman-ship to a pragmatic and commercial base. See also Art and Fashion; Pierre Cardin; Fashion Designer; Hubert De Givenchy; Paris Fashion; Paul Poiret; Vogue; Duke and Duchess of Windsor. Ballard, Bettina. In My Fashion. New York: David McKay and Co., Inc., 1960. Blum, Dilys E. Shocking! The Art and Fashion of Elsa Schiaparelli. Philadelphia, New Haven, Conn., and London: Philadelphia Museum of Art in association with Yale University Press, 2003. Evans, Caroline. "Masks, Mirrors and Mannequins: Elsa Schiaparelli and the Decentered Subject." Fashion Theory 3 (1999): 3-32. Musée de la mode et du costume, Palais Galliera. Hommage à Elsa Schiaparelli: exposition organisée au Pavillon des arts… Paris, 21 juin-30 août 1984. Paris: Ville de Paris, Musée de la mode et du costume, 1984. Elsa Schiaparelli. Shocking Life. New York: E. P. Dutton and Co., 1954. White, Palmer. Elsa Schiaparelli: Empress of Paris Fashion. London: Aurum Press, 1986. --. Haute Couture Embroidery: The Art of Lesage. Paris: Vendôme Press, 1988; and Berkeley, Calif.: Lacis Publications, 1994.